Cumulus BS 2017 is a compact loudspeaker with coaxial loudspeaker and integrated subwoofer. Cumulus BS 2017 employs an Omnes Audio Exclusive 6 woofer and a Omnes Audio CX 3.1 coaxial driver. A digital signal processor corrects the frequency response. The power amplifiers for the different channels are not included in this kit. Cumulus BS 2017 has been developed by Bernd Timmermanns. The passive crossover is for the coaxial loudspeaker. It consists of a 3rd order high-pass filter (18 dB per octave slope) for the tweeter. The mids is connected to a 2nd order low-pass filter (12 dB per octave slope). The Mini-DSP 2x4 is used for the crossover between the coaxial loudspeaker and the woofer and equalizing the system for a perfect linearity. In addition a dual channel amplifier is needed for each loudspeaker. 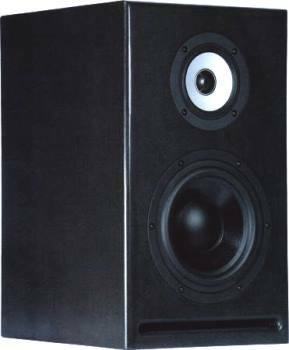 Between 50 Hz and 20 kHz, the frequency response of this loudspeaker is perfect linear on 30 degrees measurement. On Axis the frequency response has two small bricks. The decay spectrum is without fault. At low volume, i.e. 90 dB at 1 m, the nonlinear distortions are below 0.4% above 200 Hz. The high-end kit comes with Mundorf EVO Oil capacitors. All inductances are baked varnished coils for minimizing microphonic effects. - The current flow through the coil creates a magnetic field which sets the reel of wire in motion. This motion induces a voltage in the coil which adds itself to the signal. The stiffer the reel of wire is, the less the signal will be altered.